Waking up to a view of the beautiful briny sea may be the stuff that dreams are made of, but they are all the more realised in Cornwall. Tantallon, St Just in Roseland is available for £1599.20 (was £1999) from Friday 22 July – Friday 29 July 2011. Enjoy breathtaking panoramic views of St Just Creek and the Carrick Roads from Tantallon, located on the edge of the sleepy village of St Just in Roseland. Sleeping up to 7, the interior is immaculately presented, there is a spacious enclosed garden with patio and deck areas and it is located a few minutes drive from St Mawes. Up to 2 well-behaved dogs are welcome. The Sea House, Falmouth is available for £836.10 (was £929) from Friday 22 July – Friday 29 July 2011. 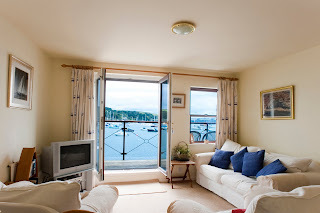 Located right on the water front and with two balconies hanging over the water, this modern ground floor apartment is perfect for taking in the wonderful seascape of Falmouth harbour and beyond. Sleeping 4, there are sea views from all rooms and there is a small guest-only communal garden overlooking the water. The town is a few minutes walk away with a fine choice of shops, restaurants, pubs and attractions. The Watch House, St Mawes is available for £979.30 (was £1399) from Saturday 23 July – Saturday 30 July 2011. Set in the heart of the picturesque village of St Mawes with views of the harbour and bay from every room, this contemporary apartment is a wonderful place to relax. Sleeping up to 6 in three bedrooms, it is very well equipped and has WiFi and large flat screen TV with DVD player. The beach is a stones throw away and the quay is close for passenger boats to Falmouth, Truro and Place Manor.